I crush 6 tablets and add to 8 ounces hot water when I first start to feel like I’m coming down with something, and continue to do this daily for up to a week. This something includes a sore throat, virus, cold, flu or just run down. Echinacea is a blood and lymphatic detoxifier, antiseptic, anti-viral and analgesic and helps the immune system overcome infections. It also can help reduce chest congestion, soothe sore throat and help speed healing for cold and flu and can help prevent them. These berries have natural anti-flu properties, can help soothe sore throat caused by viral or bacterial infection, boost the immune system, reduce viral infections and can help with rash. Larch tree bark is an immunity booster and is also anti-inflammatory and anti-allergy. It can help with chronic fatigue and gastrointestinal distress as well. I’ll start off by saying that about 80% of Americans are not getting enough zinc. When combined with the above ingredients, zinc helps with health recovery by boosting immunity. It can help reduce healing time with a cold, can reduce rash and can inhibit viral and bacterial infections in the throat. I highly recommend this supplement to prevent sickness in its tracks. Last winter this supplement kept me illness free! You can check it out & order here. 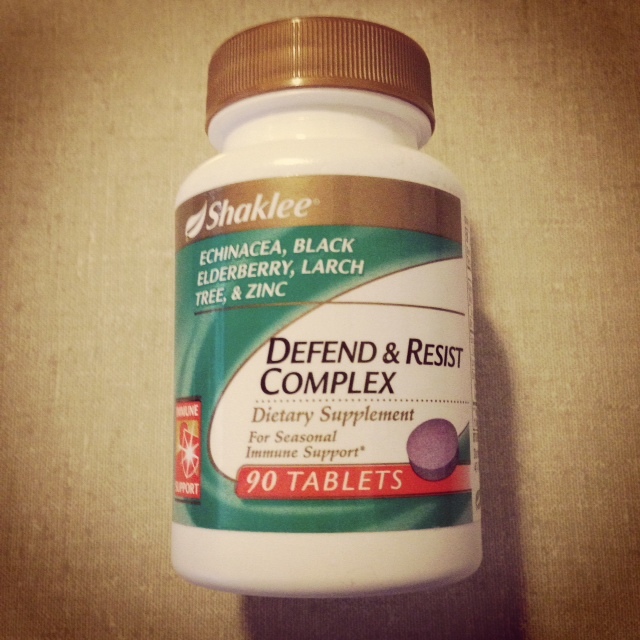 Defend & Resist Complex is gluten-free with no artificial flavors, sweeteners or preservatives. It’s safe for adults and children.